If you’ve bought any of our products from us or DriveThruCards (and you should, because that’s cool, and makes us money and is one of many ways to show your support for small independent game companies), you might have been asked about boxes. If you’ve bought a game from us in person, you probably got it in either a plastic shell box with or without a clip on it. If you bought a booklet of Dog Bear or The Suits, well, special case. Anyway, point is, that these are a common way for us to sell our games and they influence how we make our games. For example, games like Middleware and Fabricators cap out at 120 cards, but while we sell them in a shell case, we need to include two cards – called the ‘facing’ cards – that advertise the game, give you some directions and help you find the rules. That means those games are really 118 cards, which is, you know, fine. But that’s still a component of how the games work out size-wise. By default, DriveThruCards sells games with these plastic cases and they’re pretty tough and robust, and if you’re making a bigger game, much easier to use. 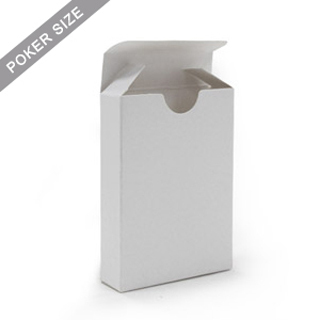 After all, a big tough case can be chucked into a bag with a little less concern about whether it’s wedged in tight – it can get jostled around and it’s not likely it’ll pop open and spill cards out forever. It’s also more replaceable – if you have a deckbox arrangement you like better, it’s less of a thing to dispose of a generic box than it is to dispose of something specific. Tuckboxes are kinda nice because they let us remove those facing cards and just put all that information on the box. They’re also nice presentation – the sides of such a deckbox can display a game instead of a line of card-sides. That, and they’re another opportunity to make the products we sell you just, you know, nice objects. That’s cool! But Tuckboxes have a problem: If there’s any empty space in a tuckbox, the whole thing can get easily squished, and if the box is squished, then it loses all its structural integrity pretty quickly. This means that games have to be designed pretty tightly to fit a tuckbox, and if a game wants to come with (say) a rules slip or space for counters or tokens, a tuck might not be a good solution. We’re currently debating how we want to handle this. After all, some people aren’t going to put their tuckboxes at risk, no matter what! On the other hand, should we assume on you what you’re going to do with your games? What about how they look on your shelf? Shouldn’t we be trying to make our games look nice? It’s a hard question to answer. As it is, don’t expect any major change, but tuckboxes are something we’re thinking about – and if you want nice tuckboxes, let us know if that’s the kind of thing you prefer! I’ve bought a few games from you, and I have to say that I’d greatly prefer the tuck boxes. Largely, in my case, because having the name on the side is a good reminder that the game is THERE when I’m staring at the shelf of games with my friends.